Alphabet Glue: Volume Seven is Here! Well, all teething and food allergy testing and school science projects aside, Alphabet Glue Volume Seven is actually ready on time. In other words, this volume of Alphabet Glue has been brought to you with support from a surprisingly understanding husband and my incredibly helpful and baby holding friends, Sarah and Annie 2.0. Volume Seven is summer-centric and full of all that is good for warm weather reading and crafting. Hold the night sky in your hand, make books to take on the road, catch and release backyard bugs, fold colorful storytelling tools and write fantastic tales. Oh, and of course, read tons and tons of really great books related to all of these things. Visit the Volume Seven page to learn more about what awaits you inside the newest Glue and to download a copy for yourself. p.s. If you are interested in the Read Aloud Book Along, there is still time to sign up. You can read up on the details here. I am quite pleased to report that Volume Three of Alphabet Glue has arrived, just in time for fall. This newest issue boasts all sorts of bookish fun, from sticker books and story buntings to non-fiction reading inspiration and printable story maps to suit all ages. Pop on over to the Alphabet Glue page to read up on all the important details and even better, to download your very own copy post haste. I think you'll be oh-so-glad that you did! Library Monday: Alphabet Glue, Volume Two. Good early summer morning, everyone! Guess what, Alphabet Glue, Volume Two (it rhymes!) is ready at long last! I'm am more than pleased to have actually made my own personal deadline on this one, and I am especially pleased because I think that Volume Two is filled with tons of super fun projects and activities that you all are going to love. From detective stories and makeshift compasses to glowing story lanterns for your summer evening picnic table, the new Glue has a wide variety of inspiration to get your family busy with collaborative summer crafting. Pop on over to the Alphabet Glue page to read more about Volume Two and to download a copy for yourself. Children's Handmade Book Exchange: Round Four. I've been thinking that it is probably about that time again. A new season is about to begin, one that is usually accompanied by a bit more leisure time than usual, and if I ask me, this means that is the perfect time to organize another round of the Children's Handmade Book Exchange. I don't know about you, but we are all sorts of ready to spend lazy summer days making stuff and eating popcorn for lunch, and I'm sure that a bookmaking/penpal project will be a popular addition to our absolutely packed schedule of sitting with our feet in the wading pool. To get a refresher on the origins of the exhange and a bit of information about how the whole thing works, check out this post from way back when. I'll make a good faith effort to match everyone up with someone close in age, and will email out exchange partner information in the next week or two, once we have a nice sized group to work with. Books should be mailed out by Monday, August 15th, 2011. Happy weekend! Mariam and I just returned from an all day Suzuki workshop at Dartmouth, so my brain is a bit mushy, but I did want to pop in for a moment to share some of this week's happenings with Alphabet Glue. I've been really, really honored by all of the wonderful things that people have had to say. From emails to blog posts and tweets, so many people have found ways to let me know that they really like the magazine and are glad to have found it. And, I really feel like people are understanding the philosophy behind Alphabet Glue, which is also amazing and very, very gratifying. - Dawn and her family have been busy, and have already done quite a bit with the story card activity. So fun to see the cards in action! - I think that Amanda and Emily both did a wonderful job of capturing the spirit of Alphabet Glue in their posts, which I really and truly appreciate. - Apparently, Nicole's girls have already made paper houses and used the characters from the story cards as their inspiration for decorating them. - Angel is right about thinking that she was among the first to download Alphabet Glue. Actually, she was the very first. - Molly's mention of the fact that the seed pod activity was inspired by Miss Rumphius, by Barbara Cooney, has brought a number of folks my way. I had no idea that this book was so close to so many people's hearts. I've created a Facebook page and a Flickr group for Alphabet Glue. If you would like a chance to win a copy of the magazine, "like" it on Facebook and leave a comment here letting me know that you did so. I'll pick two winners on Tuesday, March 29th. Bookmaking with Children: Recycled Book Accordion. This project is kind of a funny one. Super easy but made with unlikely materials, this accordion book is the sort of thing that you wouldn't necessarily think of, until you do and then you can't believe you didn't think of it sooner. In both my teaching life and as a volunteer at my local library I have learned that books, despite all appearances, are not forever. In fact, a well-loved book in a children's library may not last all that long at all. Bindings get broken, pages get torn, water or juice gets spilled. Before you might think, a book needs replacement. Which leaves the question of what to do with the old copy. Recycling a book in your front yard bin has always felt really odd to me. For the most part, I have never been able to bring myself to do it. But after some amount of thought, I decided that I do feel okay about recycling old books into new ones. Especially if they are about to get tossed into the school or library recycling bin anyway. There are obviously fancier and more involved ways to turn old books into new ones, but for our purposes, we used a variation on this project. A very simple accordion fold yields a book that can be made in minutes flat and used right away. If you are very nearly seven, the expediency of a craft project is highly important. Lay your paper out on a flat surface. The key to getting a nice crease in the paper is to be able to press down hard as you make your folds, so make sure that your work surface is sturdy. Fold your paper in half in the landscape, or lengthwise, direction. Make a nice sharp crease at the fold. Fold the paper in half again by bringing the two shorter ends of the paper together and matching them up carefully. Now take each half of the folded paper and fold it in half again, creating an accordion fold like the one pictured below. We used round two-inch sticky labels to cover the text and images on the recycled paper and to create a new, blank space for writing and drawing. Of course, Mariam declined to add any actual words to this story, so I have absolutely no idea what's going on in these pictures. If you are looking for old books to use for this project, I suggest asking your local librarian for "weeded" volumes that are headed for the recycling bin. You might also check yard sales now that spring has arrived in places that are not Vermont and people are likely to be spending more time out of doors. 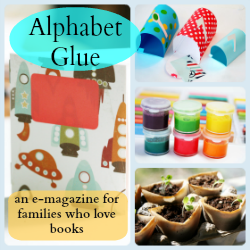 Introducing Alphabet Glue, an E-Magazine for Families. I actually did it! Volume One of Alphabet Glue, my new e-magazine, is officially available. And, I've decided that it deserves its own page here at Bird and Little Bird, so click here to learn out all about the new magazine, to get a sneak peek at a few of the things you can find inside and, most importantly, to get a copy for you and yours. Bookmaking with Children: Nature Journal with Twig Binding. I'm celebrating my snow day by sharing a new bookmaking tutorial over at The Magnifying Glass. Click here to pop on over and learn how to make this super simple but very sweet little nature journal! Edit: It looks like Teri is the winner of the giveaway! I'll be sending out your package shortly, Teri. It took me an extra day or twelve, but I finally have a lovely little package of bookmaking supplies organized to send out to someone participating in the exchange. Here's what I dug up for you: some blank library cards (so fun! ), some little cardstock tags, tiny manilla envelopes, colored sticky labels, brightly colored regular weight paper and, some really nice cover weight paper in a couple of different colors. I'll very likely find a few other tiny tidbits to add in over the next day or two, but those will just have to be a surprise! So, if you are participating in the exchange and would like to have a fun little package of office-supply goodness sent your way, leave a comment on this post. I'll pick a winner post-weekend and we'll go from there. I am in the process of matching exchange partners now, but if you are still interested in participating, send me an email at birdmail@gmail.com. We'd love to have you! Children's Handmade Book Exchange: Round Three. Well, I think it's that time again. I know I promised a fall swap, but things were so very busy around here that I couldn't quite squeeze it in, and I thought that maybe you couldn't either. But now is good, so how about it? The idea is the same as in the other exchanges, your child will be matched with a partner close in age somewhere in the world, and should create a handmade book to share with them. Mariam and I might not be able to resist the urge to get a tiny bit fancy with ours this time (I just stocked up on some pretty cool bookmaking supplies), but you certainly don't have to. At all. The philosophy that I really want to share through this process of making and exchanging is simple: each of us is an author, each of us has a story to tell. Maybe your child's story is well developed, has characters, setting and plot and he or she can write it all on their own. Maybe not. Maybe your child's story is made up of simple illustrations that they describe to you, with you doing all of the writing. Maybe it is something altogether different, something that none of us can yet imagine. Let's find out. An email to birdmail@gmail.com with your child's name, address and age. I'll match your child with a swap partner as close in age as I'm able to. Books should be sent out by Tuesday, March 1st. If you are of the blogging persuasion, feel free to grab the button below and repost it to your own page. If you need source code, just let me know and I can dig it up and email it along. Oh, and one other thing. Later this week I'll be posting a giveaway for some fun bookmaking materials, so if you are planning to sign up for the exchange, check back for that, yes? Okay, let's get making!